or Click Image below to download, print and complete the entry form. This year will see this famous run for the 54th year. Conceived in the pub of the Old Country Club in Golf Street, by late Dave Gardner and Dart Bousefield. The first 2 years, 1966 and 1967, saw the runners coming into Ladysmith via the by-pass, down Harrismith Road, turning into Keate Street, then Queen Street, running through the old car park next to the Town Hall and finishing with a lap around the old Oval. Mayor Rankin of Bergville started the Inaugural race at 07h00 on 8 May 1966. Manie Khun was the first ever winner in a good time of 3:42:20 for 56 km. Since those early days, both the start and the finish have been changed quite considerably. This year’s race will start in front of Bergville Municipality in Bergville and finish at the LAC Clubhouse in Klipbank Road, making it a distance of 52km. Starting time is 06h00. A 21 km run will also take place on the same day and will start at 07h00 from the LAC Clubhouse in Klipbank Road. 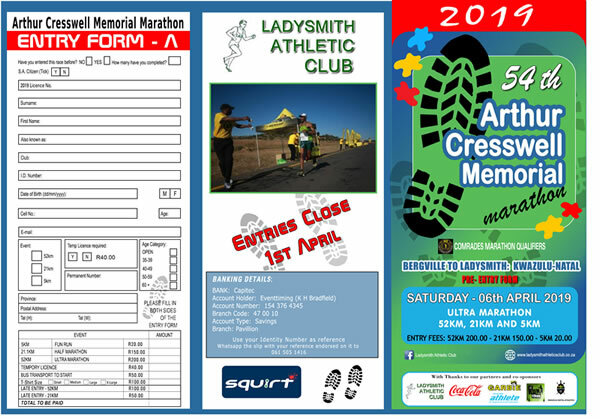 The race could never take place without the sponsorship, support and help of business houses and the public of Ladysmith. (Names of businesses who contributed will be published after the event). We are proud of the fact that our seconding tables are known as some of the best in the country and a very big thank-you to all of those who so willingly man them. We are looking forward to a large crowd supporting the runners at the finish. We are looking forward to seeing all our supporters there ! !